Censored Voices *, a volatile documentary laying bare young zionist soldiers’ consuming qualms about the Six Day War, was released in 2015. 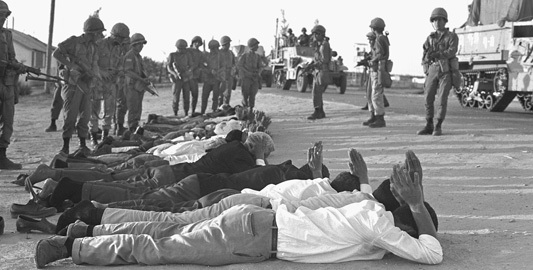 Now, at the 50 year anniversary of the Palestinian Naksa, it offers explosive information about Israeli atrocities, profound anti-war insights and glimmers of hope for a future one state wherein Palestinians and Israelis live side by side as equals. The documentary, by director Mor Loushy, was gleaned from 200 hours of taped testimonies collected from a number of kibbutzes only10 days after the war’s end by Amos Oz and Avraham Shapira. Loushy adeptly blends the tapes, listened to by eight surviving participants, with rare archival footage. In 1967, Shapira was permitted to use only 30% of the material in the tapes, as the remaining 70% was censored by the IDF. Loushy’s film draws on the censored 70% where Israeli war crimes committed against prisoners of war and civilians lurks unpunished. I knew that I had to follow orders and I was so caught up in it …, It didn’t occur to me that I should be thinking, I knew that I just had to do it. There were people of the roofs, they’re civilians , should I kill them or not? I didn’t even think about it. Just kill! Kill everyone you see! And then there is the justification of necessity. According to Ushpiz, “Above all, there is no evil that does not occur in the name of some “necessity.” The tapes reveal the soldiers believe they were fighting a just war of self-defence. The government propaganda was so effective that none thought to challenge the fiction of the cause of the Six Day War; the old lie of Israel as David-the-victim versus the Goliath-Arab-threat when in fact the real agenda of the preemptive attacks was the restoration of Israel’s deterrence capacity and a land grab that reaped the Sinai, Golan, Gaza, West Bank and Jerusalem. So if you say we fought for our existence, it’s worth Mishi’s fingernail. If you say we fought for the Western Wall, it’s not worth Mishi’s fingernail”. Nor, I add, was the war worth the fingernails of 15,000 slaughtered Arabs or of the cruelly displaced 400,000 Palestinians. Zionism is a tragedy from the start. Our return to this land involves some form of banishment. Banishment. Found our kibbutz were Arab villages: Nuris, Mazar, Kumi. They’re gone! The existence of the Jewish people and their return to this land involves expelling those who lived here. If there was a moment of recognition of the war years and the Holocaust, it was when I was driving into Jericho and saw the refugees leaving. I could identify with them completely. I could see myself in those children who were carried in their parents’ arms, when my father carried me. It was in those moments feeling the pain of your fellow man, of the Arabs who we were fighting. The Arabs were having experiences similar to those we had in World War II. Perhaps that’s the tragedy. That I identified with the other side. With our enemies. I no longer have the will to steal other people’s land. Really, we’ve done enough. All we need is to make sure there will be peace in this land. All this talk about how it belongs to us historically..all the world belongs to the Jews because there were Jews everywhere, and not every place we conquer will belong to the Jews. I no longer have the will to take the land and the property of others. None whatsoever. The last line in our anthem is, ‘To be a free people in our land, the land of Zion and Jerusalem’ As long as we occupy another people, we are not a free people. We’ve lost the ‘free people’ part.